Every other Tuesday we have Family Game Night! Featuring games suitable for all ages. Check events calendar for dates. On Wednesdays we have our MTG Draft which is aimed at those wishing to participate in the latest MTG Draft format. Keep what you draft and prize packs, and as always, very beginner friendly. We also have D&D at 6pm for anybody and everybody, FREE! Thursdays the schedule is full with just about anything you can want! 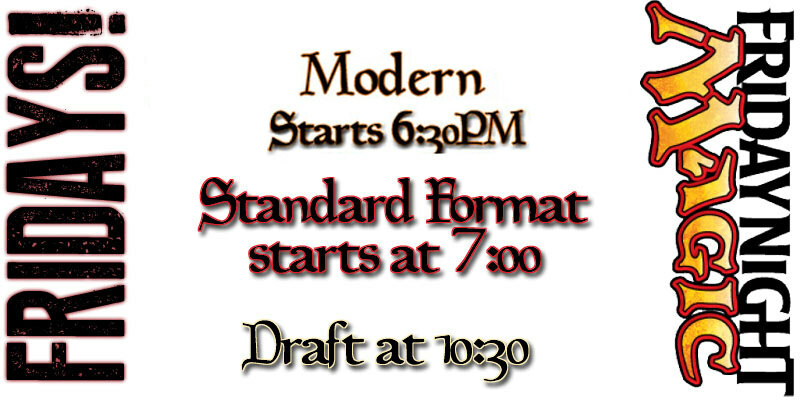 Pokemon at 6PM (Video Games/Card Game), Legacy and Modern MTG at 6PM, and a MTG Standard Draft at 8PM. Of course every Friday we have our Magic schedule packed deep! © 2019 All Rights Reserved \\ The End Games.